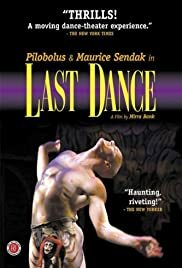 A documentary about the collaboration between dance company Pilobolus and Maurice Sendak, who together created a dance-theater piece about the Holocaust. Last Dance tells the story of how an artistic work was created by two distinctly different artists. One was Pilobolus, the dance troupe who has thrilled us for decades with their imaginative, athletic and acrobatic pieces. The other was Maurice Sendak, author and artist best known for his children's books. The film is actually an exploration of creativity (which both parties have in spades) and collaboration. Since Pilobolus is a group, its members don't always agree. The "problem" was to find a process that allowed the multi-faceted Pilobolus and Maurice, the storyteller, to find harmony in their divergent creative processes. Maurice provided the backstory for the dance--the true tales of the Holocaust and the horrible stories of death and inhumanity that, as a Jew, meant so much to him. Beyond that, everything was up for grabs. Pilobolus was used to first creating movements, then finding a story. Maurice was used to starting with a story, then finding ways of expressing it. At times, it looked as if the collaboration would fail, mostly because Maurice was seeking agreement, but Pilobolus saw conflict as part of the process. And so the film's story is about collaboration. When two parties come together with different points of view, different styles, or different agendas, synthesis can be difficult. At some point, Maurice contributes his graphic representations of costumes and the set. This helps to shape the characters of the dance. He also introduces the group to the music of Hans Krasa, himself a victim of the Holocaust. We follow the development of the dance from its first steps to its New York debut at The Joyce Theater. I found it interesting that archival footage of the Holocaust gave the film (not the dance) more impact, as if we could better see the mental images that haunted Maurice. In the end, neither of the two parties got exactly what they wanted. But the resulting piece definitely a synthesis of their talents and viewpoints--a passionate portrayal of individuals' emotions and the inhumanities of men.